The section DM is interested in all mathematical problems of a discrete nature. The three chairs within DM maintain the three main research areas: the more applied coding theory and cryptology; the combinatorial optimization which goes into problems in operational management; and the more fundamental discrete algebra and geometry. Coding Theory is the mathematical theory of encoding information in such a way that it becomes resistant to transmission errors. The main topics are the study of the properties of various codes (cyclic codes, BCH-codes, MDS-codes, algebraic-geometric codes) and the construction of efficient decoding algorithms for these codes. Cryptology is the mathematical theory of protecting information against unauthorized access (privacy), determining if a message has been altered by a third party (integrity), adding a signature to an electronic document and verifying the identity. The Combinatorial Optimization (CO) group focuses on the analysis and solution of discrete algorithmic problems that are computationally difficult (NP-hard). A generic formulation of such problems is: given a number of boundary conditions and constraints, find a solution that minimizes the cost or maximizes the profit. Phenomena throughout mathematics and the natural sciences have discrete algebraic aspects, often along with analytical counterparts. While the latter are typically modelled using real numbers, differential equations, and numerical computations, describing the discrete-algebraic aspects involves objects like nite elds, graphs, polynomials, groups, algebras, and symbolic computations. 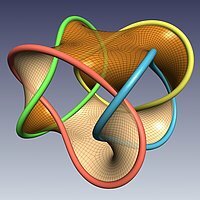 The Discrete Algebra and Geometry (DAG) group at the TU/e develops the mathematics needed for such a description.